Amongst these directors, the late Bimal Roy—his mentor—obviously featured on top of his list of favourite directors. Incidentally the letter which he received from Bimal Roy Productions calling him for a screen test was dated June 8, 1957; Bimal Roy passed away on January 8, 1966; and dad passed away on March 8, 1972. But then this is not about numerology, it is about Mr. Roy. Sometimes there is a communication gap between the actor and director. In one scene from a film for instance (if memory serves me right I think it was “Chhoti Bahu”) dad had to deliver his dialogue and laugh. The director was not satisfied with dad’s laughter but at the same time was unable to communicate what he wanted. Finally dad offered a solution: he laughed in different ways and the director chose the one he found suitable. With Bimal Roy however there was no such communication gap; dad just knew what he wanted and Roy was able to convey his needs very clearly. For a scene in “Sujata” for instance he insisted that dad should look up. When dad asked him “Why do I have to look up?” he replied, “Just do it”. When dad saw the scene on screen he saw its impact and realized why Roy was so insistent. I unfortunately do not know which scene this was, for I was very young when dad used to talk about this and I never thought of asking him. My father used to always say that it helps a lot when a director is also technically qualified. 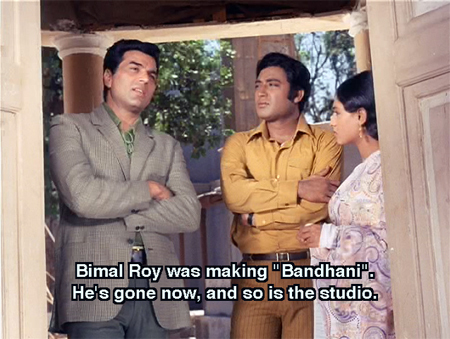 Bimal Roy was a cinematographer before he turned director, and likewise Hrishikesh Mukherjee—also a favourite of dad’s—was an editor before he became director. Hrishikesh Mukherjee was considered one of the best editors in the industry. 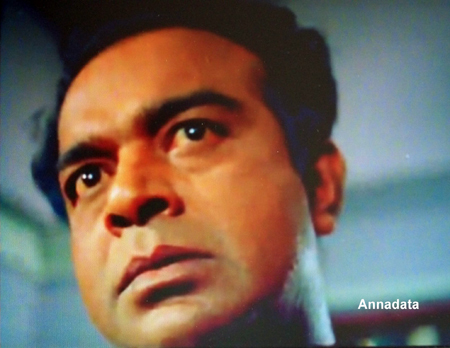 Dad did two films with him, “Anupama” and “Satyakam”. Being an editor, dad said he just edited the scenes in his mind before shooting them. He just knew how far to go. I think if you see “Guddi” you will see his excellent editing. I am digressing a bit but mentioning “Guddi” brings back some memories. 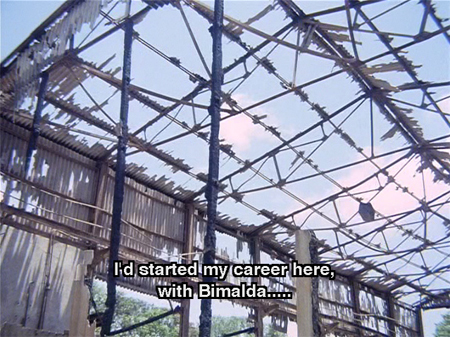 There is a scene in “Guddi” where the camera focuses on a section of Mohan Studios which was gutted by fire and Dharmendra says that he had started his career right there. Watching this scene, dad told us that he too began his career on that studio floor. 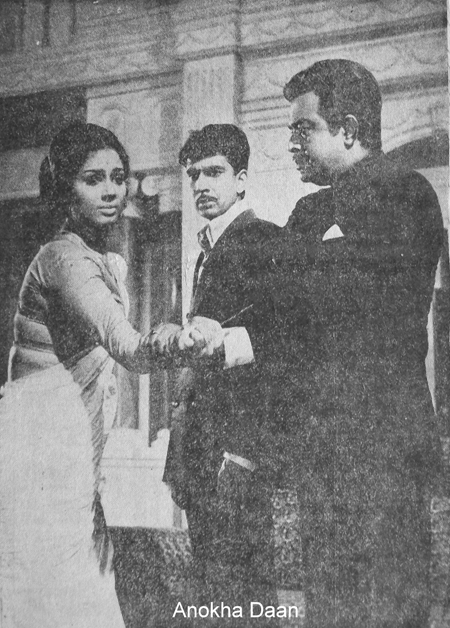 Coming back to Hrishikesh Mukherjee, what dad liked about him was that after explaining he left it to the actors to interpret the scenes the way they wanted to. But he too like Roy was very sure about how he would shoot a scene. For the last scene in “Anupama” for instance, Mukherjee took dad to a railway station outside Bombay. I had the opportunity of interviewing him for a publication and he told me (he did not know he was being interviewed by Tarun Bose’s daughter) that just for one single shot of dad he took him all the way to the station because he was sure of what he wanted and the kind of impact that scene was going to have on the viewer. Needless to add, that scene continues to make a strong impression on the audience. Another director with whom dad loved working was Dulal Guha. Some of Guha’s noteworthy films are “Dushman” (Rajesh Khanna-Mumtaz), “Dharti Kahe Pukar Ke” (Jeetendra-Nanda-Sanjeev Kumar), “Dost” (Dharmendra-Hema Malini-Shatrughan Sinha) and “Do Anjaane” (Amitabh Bachchan-Rekha). Dad did quite a few films with him (“Chand Aur Suraj”, “Dharti Kahe Pukar Ke”). Dad enjoyed working with him and marveled at his ability to extract good performances from even those actors who were not very talented. Asit Sen was another director whom dad appreciated and what he liked about Asit Sen was his shot taking: the way he framed his shots, the placing of the camera at a low angle, and the close ups. The shot of “Annadata” that you see here is a typical Asit Sen shot composition. “Anokhi Raat”, “Annadata” and “Anokha Daan” were the films which dad did with Sen. “Anokha Daan” was based on the classic novel “Inspector General” which was made into an English film featuring Danny Kaye. Several years later there was a Bengali film based on this story featuring Uttam Kumar. “Anokha Daan” had Kabir Bedi, then a newcomer, in the lead. My father played the role of a corrupt politician, but unfortunately Asit Sen the maker of such sensitive films as “Mamta”, “Safar” and “Khamoshi” had lost his touch and the film was a flop. Although it did not matter to dad since the film had released after he passed away, I feel it was quite unfortunate because he was very happy with this role and had worked very hard to give an excellent performance. It is quite sad but every actor at one time or the other has seen his or her performance wasted in a flop film. Another such noteworthy performance of my father was that of a drunkard in “Jyot Jale”. This film was about how a man’s (my father) addiction to alcohol ruins his family compelling his wife (Nirupa Roy) to throw him out of the house. 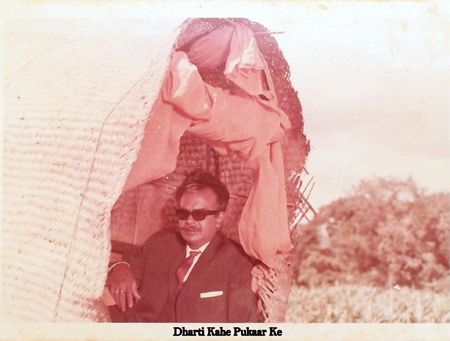 Dad’s performance of the drunkard was so authentic that most people asked us and dad whether he came home completely drunk during the film’s shooting. Dad laughingly answered, “If I were really drunk I would not have been in my senses to give my shots.” This performance was wasted because the film flopped. I am not surprised because I found the film quite preachy, and to make matters worse there were no stars to attract the audience. Interestingly one of dad’s weaknesses came to the fore while making this film. The director Satyen Bose wanted dad to lip synch to a sad song (‘Aur Kitne Gham Uthaye Aadmi’) after he is thrown out of the house. Dad was not at all comfortable either lip synching to a song or doing a dance sequence. After the song was picturised dad was not happy with the result so the song was re-shot, this time with the song playing in the background. The still from “Jyot Jale” is from that song sequence. “Jyot Jale” brings to mind Abhi Bhattacharya, who played the role of a teacher who takes the drunkard’s wayward son under his wing. Abhi Bhattacharya had an interesting trait—more about that, some more incidents and last but not least a puzzle in my last post. Posted on August 24, 2010 at 11:14 am in Hindi movies	| RSS feed You can skip to the end and leave a reply. Thanks for the screen caps from Guddi. It sort of completes my post. I told Hrishikesh Mukherjee after I finished with the interview and was taking his leave and yes he was very happy. I’m glad you told him, although I can understand if you’d told him right off the interview might have gone off the rails about (although would have been fun for you! )…from all accounts Hrishida was a very nice man. Another wonderful post. I’m pleased to know that your Dad liked his work in “Anokha Daan” – it really is a terrific performance. It’s an unusual film with an interesting, “hatke” plot, gorgeous music and good performances. Well glad to know that some one has seen dad’s performance in Anokha Daan. That film sank without a trace. Since Guddi was directed by Hrishikesh Mukherjee and written by Gulzar who also got his start with Bandini, I guess that scene held meaning for quite a number of people. I can only imagine how they all felt hearing that line. It kills me now that I know the context and I’m just a member of the audience. Re: Dulal Guha. Funny, I’ve seen all those movies you mention but never noticed his name. Journeyman directors are fascinating. Westland/Tranquebar will be releasing an anthology on film writing later this year, so obviously they’re interested in cinema, and not necessarily only the lives of the biggies. Try them, Shilpi! Well dustedoff it is nice to know the our fathers share the same birth date.BTW where do I get the details of Westland/Tranquebar? Is it avaiable on the net? Shilpi maam, I watched “Anokhi Raat” this weekend and while checking the details of the cast, I was shocked to know that Mr. Bose passed way in 1972 at the age of just 43! Did he have any health problems maa’m? Wikipedia doesn’t give the information. I was born in the 80s but is a big fan of 50’s and 60’s Bengali arthouse movies and similar Hindi movies. Well in response to what you have mentioned about some publisher offering me an opportunity to write a book, I have to say ‘Clarified butter and sugar in your mouth’. Before you think I have taken leave of my senses well that is the literal translation of a typical Hindi film dialogue “Tumhare Mooh Mein Ghee Shakkar”. If I were to render that into English then it would mean, “Hope what you say comes true”. With well- wishers like all of you one never knows. But for the moment I am happy with this limited but meaningful exposure. In English we say “From your mouth to God’s ear.” :) Suhan translated it to me once as “May your mouth be filled with ghee and sugar” which I now like to say to people instead! Well memsaab “From your mouth to God’s ear” and if I may add from God’s ear directly to some publisher’s ear. Thanks everyone for the generous praise. Shilpi, This is lovely. I wish you would write a book on him. Your anecdote about the director, Asit Sen is interesting in that I’ve read Sharmila Tagore talk about how Asit Sen taught her to work the camera as an actor. Dulal Guha is indeed underrated given that he directed many of the early 70s blockbusters like Dushman, Dost and Pratigya. Regarding his Do Anjaane, parts of which were shot in Darjeeling in St. Paul’s school, apparently, Amitabh Bachchan was a big sport in how he interacted with the boys in school! From your above, it appears that your father was a favorite of the Bengali directors. Would you surmise that interactions, because of that commonality, made for easier communication and elicited better performances? You are right all his favourite directors are Bengalies, in fact it struck me after I wrote the piece. Apart from presenting your dad’s experiences with various directors, it also reveals, maybe unintentionally, how important the director-actor relationship is. Just loved reading this. I have seen many of the movies you mention here and have a high opinion of all these directors. Looking forward to the next instalment. Thank you once again. Shilpi – This post made for wonderful reading. Now I feel like watching all those movies that you listed, once again. I look forward to your next post. Please share some juicy anecdotes if possible. Thanks Shilpi once again for sharing such interesting anecdotes about your father and some of the famous directors whom we appreciate. The Dulal Guha movies you mentioned were indeed good (we hardly pay attenton to the director some times) – i have seen all the movies listed except Do Anjaane which has been sitting in my pile of TBW movies! Looking forward to your next post! Oops Dharti Kahe Pukar Ke is another movie I have not seen. I have seen some of the songs though. I am not very good at English, so I don’t know what other adjectives can I use other than the ones above, Shilpi. It was as if I was transformed in time to those places where the famous scenes were canned. A good one ! Anyways, its interesting to know that your father didn’t lip sync to a song. I tried to remember if there were any songs picturised on him where he was doing exactly that, but none seem to come to mind. Am I missing something here? No you are not missing anything here, he never did lip sync to a song. It was lovely reading this, Shilpi. @Shilpi – Did yur father ever discuss Raja Nawathe with you? 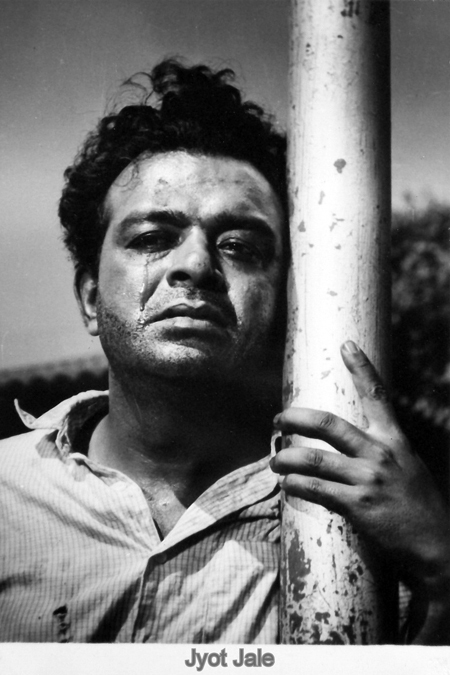 He was the director of ‘Gumnaam’ (1965) and did manage to scare the daylights out of me. Your father was just too awesome in the movie. Super read Shilpi of Dada. We seem to be getting even closer to him now. Dada acted quite a lot with Dada Moni, wud be really g8 if yu cud share some thoughts on this fab Jodi. Dada Moni is def another g8. I envy you ash you have managed to get Ma Beta I have not seen that one. I can do a lil gesture from my side (least I can do for Dada’s kids .) and load this for yu, I will rip the VCD to XVID, is that OK ? bcos the .dat files wud be too big to load, if yu were on any of our Group/Torrent sites, then this full movie def coming up next week, Memsaab can help yu here with info I am sure and if yu need a invitation, let me know, again am sure Memsaab will be more than happy to tell yu abt our Group. Do let me know what every yu decide, bcos I will load the rip next week, am sure many of our loyal readers here wil also like to grab this. Well to be honest I have not understood much of what you have written because I am not that net savvy but please you do not have to go to any trouble for me. I will manage to get Maa Beta, I need to devote some time to look for it. A wonderful read just as with other 4 parts. There is this poignancy atttached to the studio (brought to life by the picture of it) and memories of so many people regarding it. I remember that scene from Guddi very well. The directors and several films you have mentioned are among my favourite. Lovely, Shilpa. So enjoyed this newest post of yours. And I look forward to hearing about Abhi Bhattacharya, who is one of my all time favorite actors. What a great blog! I wonder why I couldn’t search it earlier! I am a big Oldie fan. Tarun Bose is one of the greatest Bengali actors which made marvels in small character roles. My other favorites include Abhi Bhattacharya and Harindranath Chattopadhyay. I’d suggest U shift to theme Mystilook. Your blog’ll look much more refined. I better go and look for a blog subscription link! Thanks Memsaab, U made my day! WordPress has just introduced sharing buttons under individual posts. Try them. Subscription link is at the bottom of the sidebar! Here folks and esp Dada fans get this movie MA BETA 1962, it is a VCD in full, and be assured the audio/video is very good, sry no SUBS. DO…. if yu see this msg, catch the Mukesh Bhai and Hemantda, rare duets we do not hear them so often. Thanks for the links ash. Great to have it. Thanks ash, the first attempt at downloading file failed will try again but thank you very much, hope am successful the second time. OOps pls try again Shilpi, on the whole Megaupload is very good, hardly get link breaks and even if it stops mid-way one can stop/pause/restart from the point of this stoppage . I work with FF and all Downloads gives us this facility. it will show yu the good quality of the print.. and those who just wanna see Dada and other super veterans, pls check ’em out. Saw the SS, yes the print is good. Tried again but failed, does one need to register? Sry Shilpi was out of the house and thus saw your msg a few mins ago. and after I copy the security code, clicked on download file, I get a FREE download option, and after 45 secs or so yu can click on the link and save the file. Pls make sure yu do not have any POP Up BLOCKER blocking this, pls allow TEMP ALLOW ALL if yu so wish and it shud work, I can see some people have already d/l this file. Pls take a SS if it still does not work or tell Memsaab what yu get when yu do the process, she can either fwd me the email/SS or most prob she will try to see what is happening and try to help yu out. OK Ash I will put down step by step what I did. 1) I clicked on the link given by you. 2)It took me to the mega upload site which gave me the file name Ma Beta and the code that is the letters and number which I typed in the box alongside. 3)Clicked on download file and the 45 seconds countdown began and then I saw the words regular download and clicked on it. 4)A window popped up with the title Download File. There was a URL, Folder name, File name(Ma Beta) on it. I clicked on OK on this window and the window disappeared and that’s it. Nothing happened. I had earlier downloaded mega manager, when I clicked on the mega manager icon it showed an error in downloading. Well I did tell you I am not that net savvy. I t appears Ma Beta is not their in my naseeb. Sry to hear yer hving probs getting this file Shilpi, am 99.9 per cent sure yr browser is blocking the site ie POP up blocker, what browser are yu using ? Memsaab had sent a lil note and told me she wil help yu out in case yu faced difficulty again. Pls ensure the POP UP blocker is off. Shilpi… the download manager is here, of Megaupload and ofcors it can be used for other purposes and links also…. Ash my browser is Firefox and I have already downloaded mega manager but now I am deep in the last installment of dad’s biography so I will tackle Maa Beta later or maybe I will able to get hold of a Ma Beta VCD after some searching. Another problem that comes up is that you aren’t allowed to use the facility for more than an hour or so. Then it stops and you have to wait some time. They say one hour but that didn’t work for me. What I do is change my ID by switching off the router/modem (whatever its called). The second problen could be that if after downloading you watch on your computer its fine, but sometimes when you burn a DVD the player doesn’t recognize the data so one has to be satisfied watching it on the computer. I guess its the ‘region’ thing. Thats really something new Pacifist, frankly never had any issues with Mega b4, I must have d/l around 10GB in 20 diff links. If your link breaks when u r downloading then yu cud have this stop-resume mode, and with low bandwidths it does happen in India ? It wud be a nice idea to use DOWNLOAD MANAGER, most are free, pls Google for them. Here firstly yu can see all what is being d/l and if they stop in between then just pause and start again, it picks up from yu were cut off. Do yu burn yr DVD in DATA mode. my experience is 100 success while playing on a stand alone player, I never watch any files on my CRT, eyes pain . ), I have a mix of dvdrips, vcd files in .dat,mpeg, and music files all on one disc, it works just g8. Yeah if yr stand alone is not capable of handling DIVX/mkv /h264 codecs then issues arise with DVDrips, VCDs are universally adaptable. p.s. when yu burn a dvd with all these files, it is recommended not to burn at max speed, adjust it to 4 x or even lower, chances of corruption are much less and this esp applies to any s/w applications. If I can help further let me know and gd luck. Regarding the 70mts/60mts limit, it is for those who are downloading for free. It says in the message that if we want to have it continuously we would have to pay. I live in Europe so I guess the problem is a different one. Its getting the burnt DVD to play on my player which is. I’ll try with the minimum speed as suggested by ash and see what happens. suggest if you are not already doing so, test burn yr files first on a DVD RW, check them out and then yu can transfer to a DVD R for keeps. This way yu may save on discs going kaput. Btw which s/w do yu use for burning ? I use Image Burn, it’s free and a good ‘un, just a thought. I saw another film recently of your father, Shilpi. Its called Ek Nazar with Amitabh Bachchan and Jaya. Tarunji plays Amitabh’s father and a public prosecutor very convincingly. That DVD suggestion is a great one. I didn’t think of it and have wasted a lot. Thanks for the link imgburn, though while downloading Tom’s files I had already done that, but somehow was using another useless programme when burning these other DVDs. 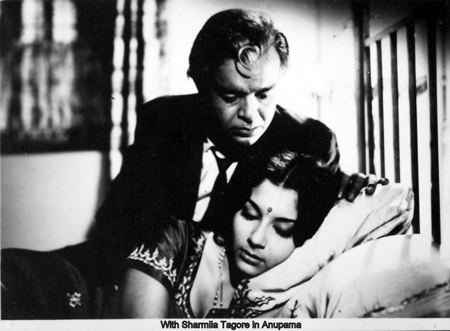 I Remember Tarun Bose played a serious role as Sharmila’s father in Anupama 1966. Please tell me the name of the actress who played the role of his wife (singing dheere dheere machal…), and post some more of her photos. Tarun Dadas wife was played by the lovely lady Surekha Pandit (99.9 per cent ) who is also in the musical Mere Sanam 1965. It has been quite a while since I saw Anupama but she could have been listed as Surekha. I have absolutely no words to thank both of you for sharing anecdotes about Tarun Bose. The media in India always focus only on top stars but never write about character artistes whose contribution to cinema is no less. I was aghast to know that Tarun Bose died at such a young age. 44 years. Shilipi – I am so sorry, as a daughter, I can appreciate how you must be missing him. The anecdotes that you have mentioned deserve to be brought out as a book. I recently saw Gumnam along with my children (12 years and 10 years) and we loved the movie. We have seen it at least 4 times, it doesn’t tire at all. The song – “Madhbahri yeh hawayen” was heard by me one evening in late 2008 on Vividh Bharati, then I came to know that this was from “Anokha Daan” – a movie on which the only info available is from memsaab story. I am so thankful to this blog. Vivid Bharathi, Mumbai, Bollywood will be so close to my heart though I have shifted base to Bangalore now – I still listen to Vividh Bharati. Memsaab – please let me know if you have any information on Rakesh Pande, Zahira and Archana all of whom acted with Tarun Bose in Anokha Dan.